The Dalite 43 x 57" Advantage Manual Projection Screen With CSR (Controlled Screen Return) is a ceiling recessed manually operated screen. The Advantage is designed with the installation process in mind. It has the luxury of having the case and fabric and roller mechanisms installed separately. Dalite employs a unique floating mounting method which utilizes adjustable roller brackets. All this is built into the lightweight, extruded aluminum case which allows for the centering or offsetting of the screen. 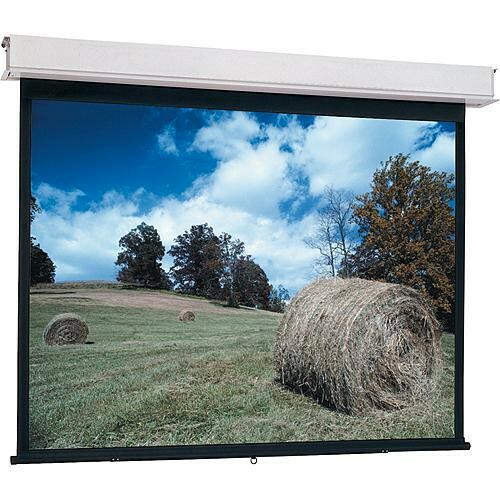 Offered exclusively by Da-Lite, the Controlled Screen Return (CSR) system adds an impressive feature to the Advantage design. The CSR system ensures the quiet controlled return of the screen into the case providing optimal performance and smooth, consistent operation. Screens with the CSR feature must be fully extended. There are no intermediate stopping positions. Box Dimensions (LxWxH) 74.0 x 13.0 x 10.0"